I don’t know what it is with Jean-Pierre Jeunet, when I first saw Amelie I though “Ok…this guy has a really good way of portraying stories” then I saw Delicatessen and I realise this guy is a genius.This is by far my favourite movie of the bunch, when I saw the trailer I knew I had to see it. T.S. is a 10 year old prodigy whose special scientific talents go unappreciated where he lives. The accidental death of his older brother is a sadness hovering in the background until T.S. is contacted about a machine he invented by the Smithsonian Museum. He decides to travel on his own and thus begins a huge adventure. 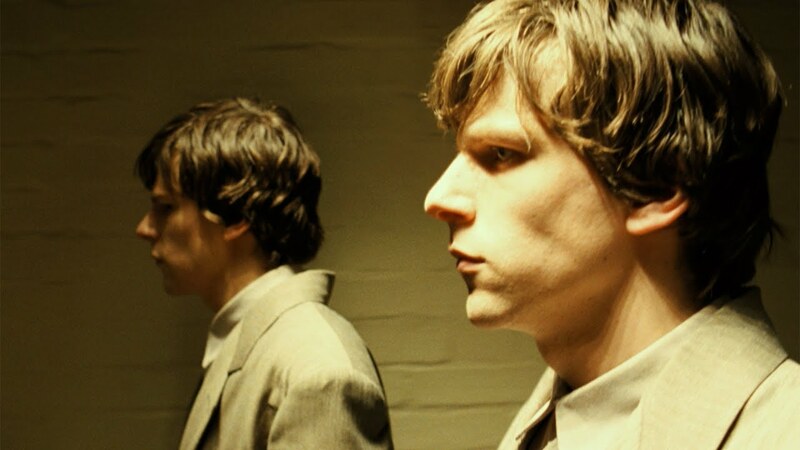 Another that caught me by its obscure trailer, set in a dystopian future with dark rooms and series of office desks, the same actor, portraying two different people…or not. This is a Dostoevsky-inspired story about an office clerk who finds himself against his worst enemy, a mirror version of himself possessing all the confidence, personality and charm that he lacks. People raved so much about this film, (also set in a distopyan future…what is it with me and distopyan futures??) After the earth suffered a new ice age, a gigantic train is built and travels around the earth thanks to a perpetual motion “thingy” machine but there is a lot going on inside the train, people are segregated into classes, poor people forced to live in the back of the train while rich people live in the comfort of the front. So as expected people plan an uprising. Amazing views of frozen destroyed cities and surreal train compartments, together with a terrific performance by Tilda Swinton and a scruffy looking captain america’s Chris Evans, makes this film one of my must see of this edition of the festival. So…these are my 3 favourite picks for this years festival, please let me know if you saw any of them and what did you think about them (no spoilers please) and if you know which other films are being shown in the NZIFF and you would like to recommend some more please do so. Yo no sé lo que es con Jean-Pierre Jeunet, cuando vi por primera vez Amelie pensé ” Muy bien … este tipo tiene una muy buena manera de retratar historias” despues vi Delicatessen y me di cuenta de que este tipo es un genio. Esta es mi película favorita del grupo, cuando vi el trailer supe que tenía que verla. T.S. es un niño prodigio de 10 años, cuyo talento científico es poco apreciado donde vive. La muerte accidental de su hermano mayor, es algo que se asoma en el fondo de su familia hasta TS recibe una carta del Museo Smithsoniano por una máquina que inventó. Él decide viajar por su cuenta y así comienza una gran aventura. Otro que me llamo la atencion por el trailer, ambientada en un futuro distópico con cuartos oscuros y una serie de mesas de oficina, el mismo actor, interpretando a dos personas diferentes … o no. Una historia inspirada en Dostoievski sobre un empleado de oficina que se encuentra frente a su peor enemigo, una versión reflectada de sí mismo que posee toda la confianza, la personalidad y el encanto que a el mismo le falta. Escuche hablar tanto sobre esta película, (también ambientado en un futuro distópico … ¿qué me pasa con los futuros distópico?) Después de que la tierra sufrió una nueva edad de hielo, se construye un tren gigante que se desplaza constantemente alrededor de la tierra gracias a una máquina de movimiento perpetua, pero hay mucho más en el interior del tren, las personas son segregadas en clases, los pobres se ven obligados a vivir en la parte trasera del tren, mientras que los ricos viven en la comodidad de la parte delantera. Así que la gente, como era esperable planificar un levantamiento. Con impresionantes vistas de ciudades destruidas y congelados y los compartimentos del tren totalmente surrealistas, junto con una tremenda actuación por Tilda Swinton y un Capitán América con un aspecto desaliñado (Chris Evans), hace de esta película una de mi visitas obligada de esta edición del festival. Así que … estas son mis 3 favoritos para este año del festival, por favor, hágame saber si vieron alguna de ellas y lo que pensaron de ellas (sin spoilers, por favor) y si saben que otras peliculas se están mostrando otras películas en el NZIFF y les gustaría recomendar una por favor hágalo. Without giving too much away, Snowpiercer has very strong food themes in it. Or maybe it’s just that I’m a foodie and see that connection in everything. Please see it and let me know if you agree. p.s. Chris Evans looks quite stunning with a beard.